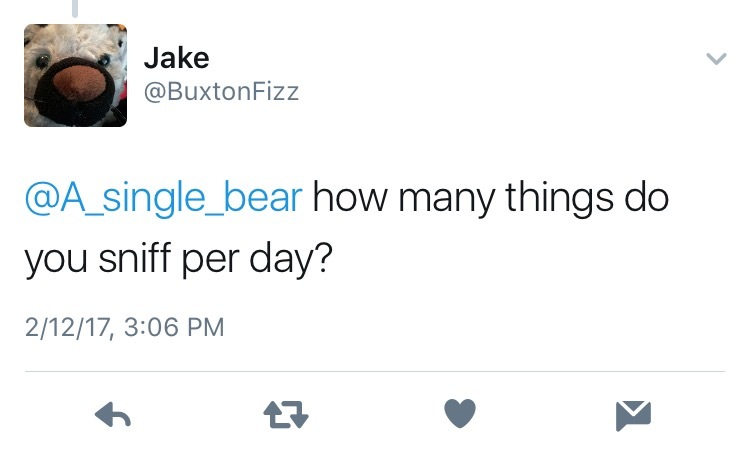 Even more human questions, bear answers. A: I do not have a set goal of the number of things I plan on sniffing during a given day, but I do try to sniff as many things as possible. There are just so many lovely smells to enjoy, so I do not like to limit myself with a set number of sniffing occasions. 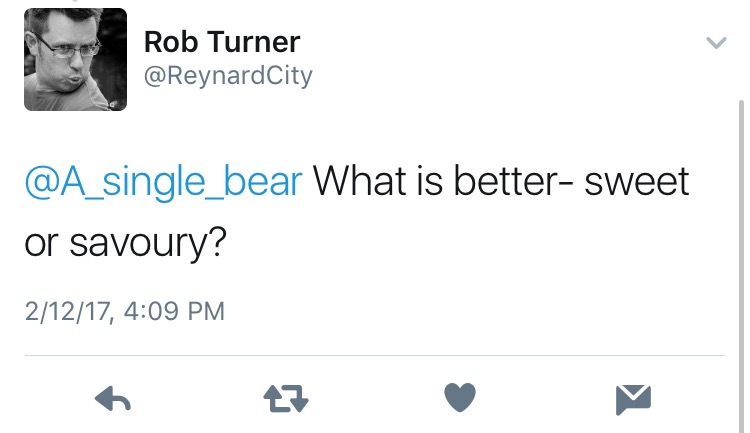 A: Berries, sticks, acorns, fish, very small rocks, leaves, discarded sauce-covered napkins, various dumpster findings, marshmallows, and anything I can find in a dumpster that is not claimed by angry raccoons or opossums. 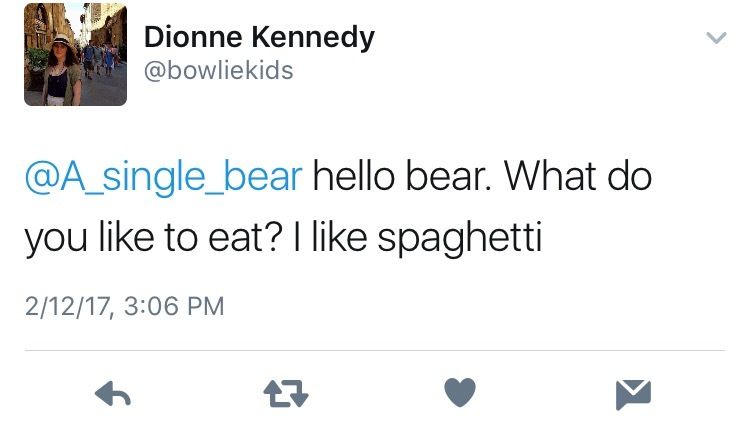 Spaghetti is good, too, but it is hard to come by. I once visited a place filled with humans who were all eating spaghetti and they yelled at me until I left. I did not get to enjoy any spaghetti. A: Might I suggest donning the finest pile of leaves and plastic bags you can find? I am not sure this will be appropriate attire since I do not know what a prom is, but I think I look quite fashionable when I wear leaves and plastic bags. 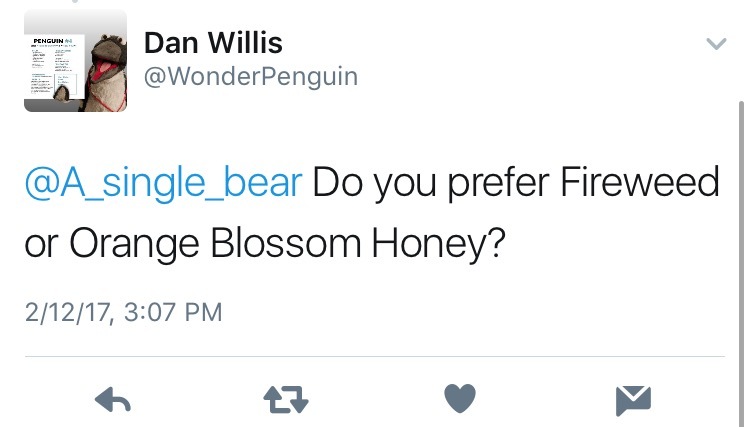 A: I prefer the kind of honey that does not leave me with several stings on my nose and in my mouth. Would that be Orange Blossom? Does that one involve fewer stings and less pain and embarrassment? 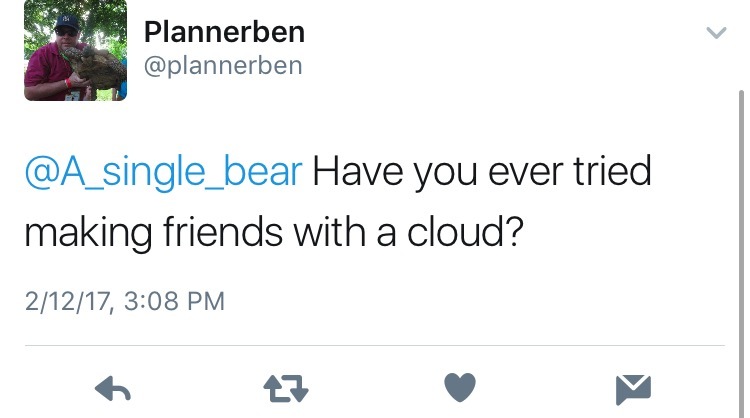 A: I have, but clouds seem to be quite fickle. Just when I think I am making a great impression on one, it decides to float away or turn grey. I wish I knew the secret to making friends with them. They are very interesting. And they look soft. 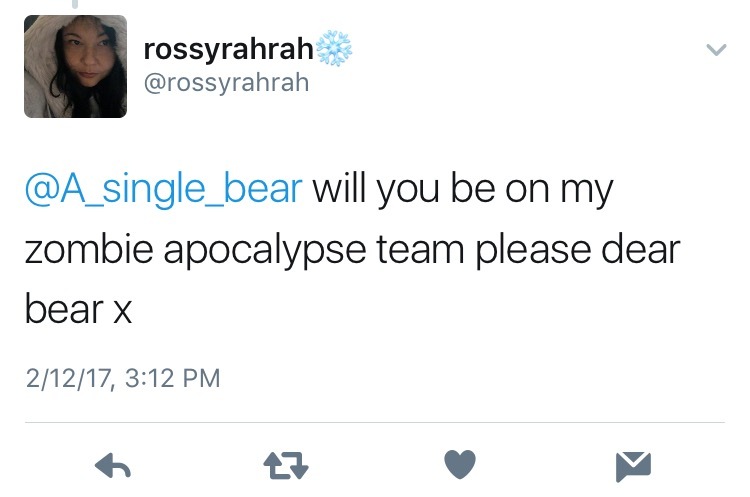 A: I do not know what a zombie or an apocalypse are, but if me being a bear will help you, then I would certainly consider joining you. Will there be opportunities for naps and/or extended naps? Will snacks be provided? I am a bear. 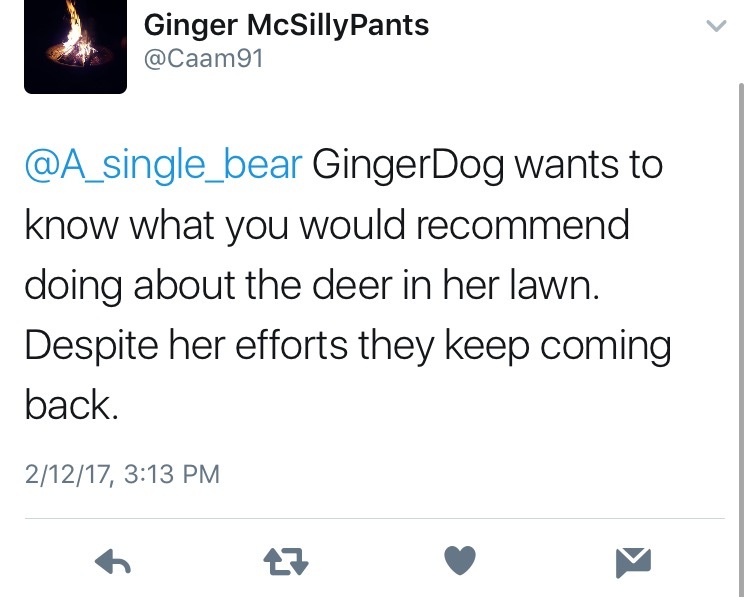 A: My only advice for GingerDog is to accept the inevitable horror that comes with deer being involved in your life in any capacity. There is nothing you can do. No amount of reaching our or wishing ill or trying to reconcile or spitting will take care of it. Deer will be there. No matter what. A: All kinds. All kinds of squirrels are very mean. I do not know why. Though sometimes I wonder if they are not mean but, rather, they have particular dispositions and my particular disposition does not get along with their particular dispositions. Or they are mean? 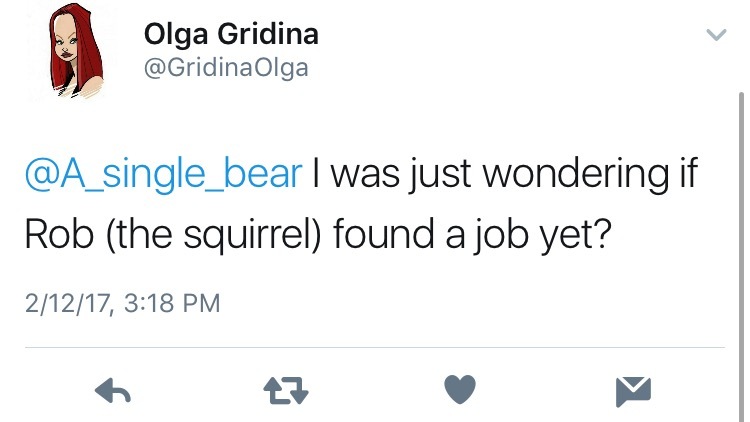 A: Rob (the squirrel)’s only purpose is to be Rob (the squirrel), I think. I am sure he does that all of the time. 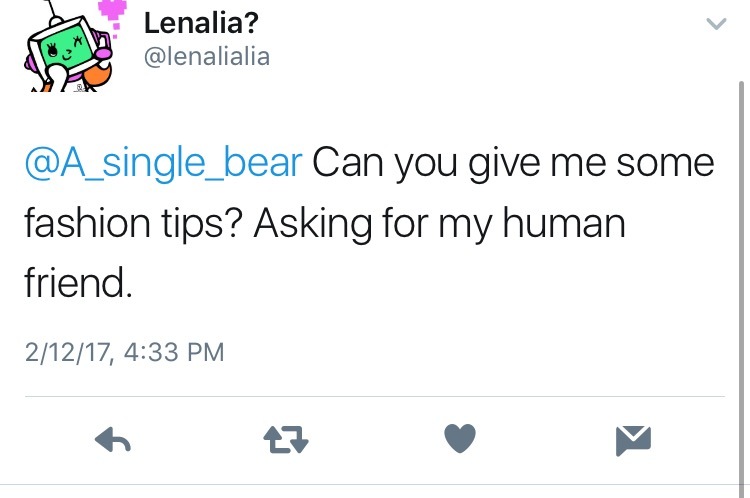 A: I think about being a bear. Sometimes I just stare? I am a bear. 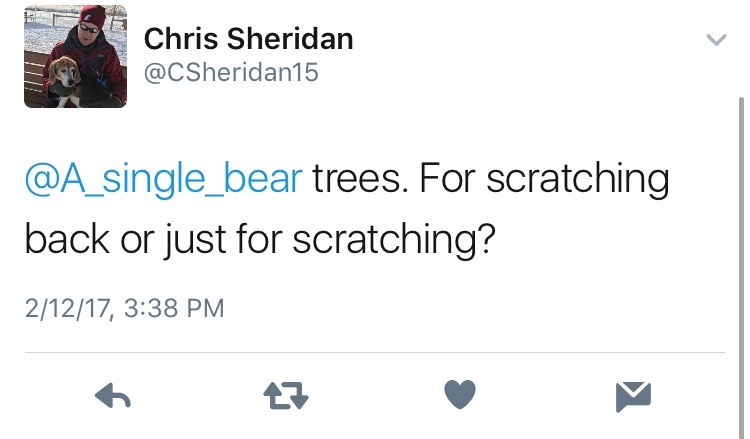 A: Trees are certainly great for scratching any part of my body that itches. But their usefulness extends far beyond this. Trees give me shade. They provide food. And they are wonderful listeners. 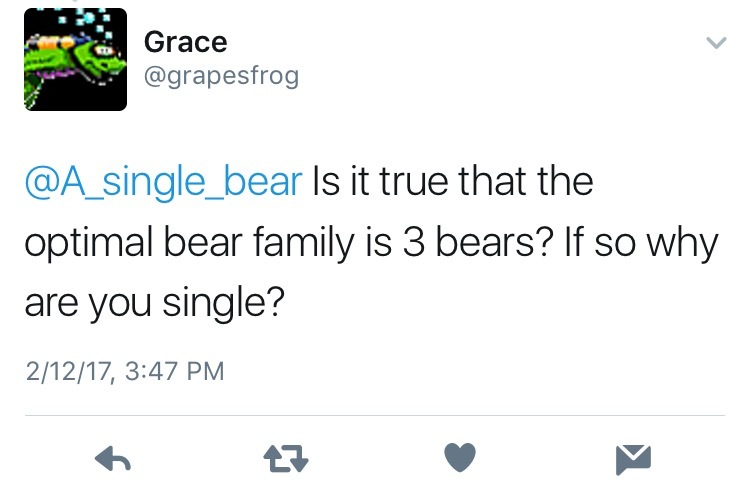 A: I do not know how many bears make a family of bears, but I am a single bear because I am just one, single bear. I am a bear. 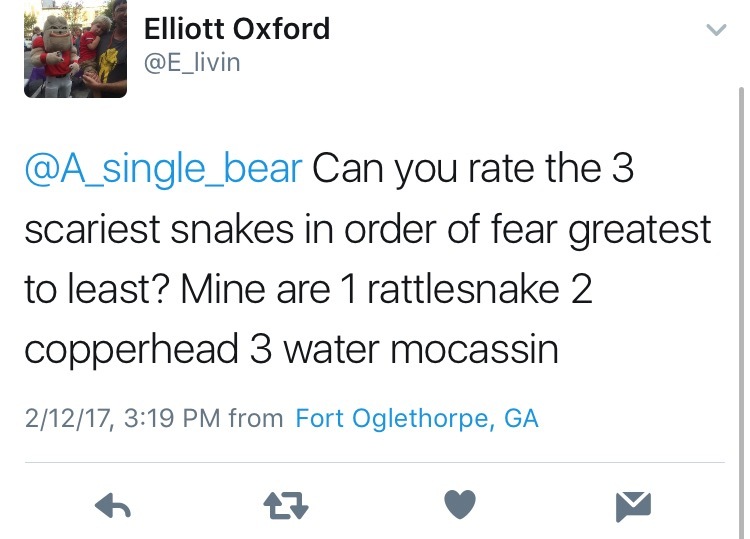 Just the one bear. 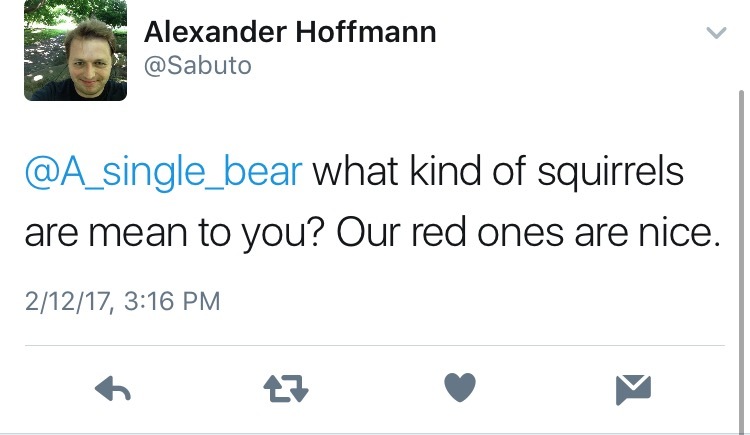 There are more bears, I think, probably, but I do not know them, and I am just one of them. 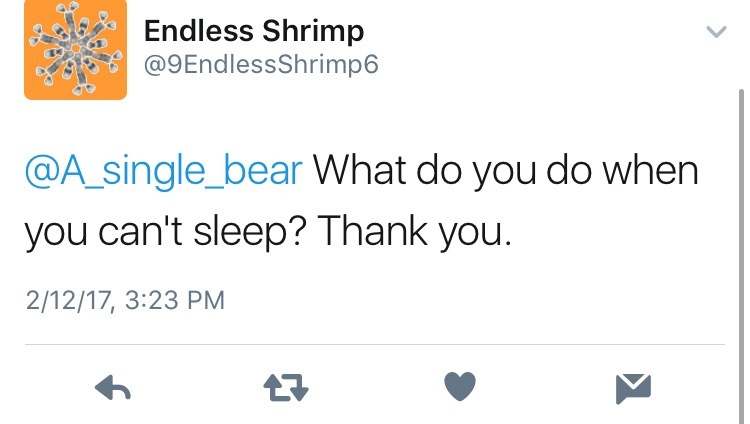 A: Thank you for noticing. I put quite a bit of work into keeping my ears in pristine condition. In order to keep their volume and roundness, I rub my ears in the dirt for several minutes and then use pinecones to fluff them up. Also, belly rubs are wonderful. A: I do not think one is objectively better than the other. I like all food and food-related products, be them sweet, savory, sour, smelly, or otherwise. I am a bear. A: While their plumage is quite stylish, birds do not make very good hats. Instead, I would suggest using sticks and leaves to accessorize your ensemble. 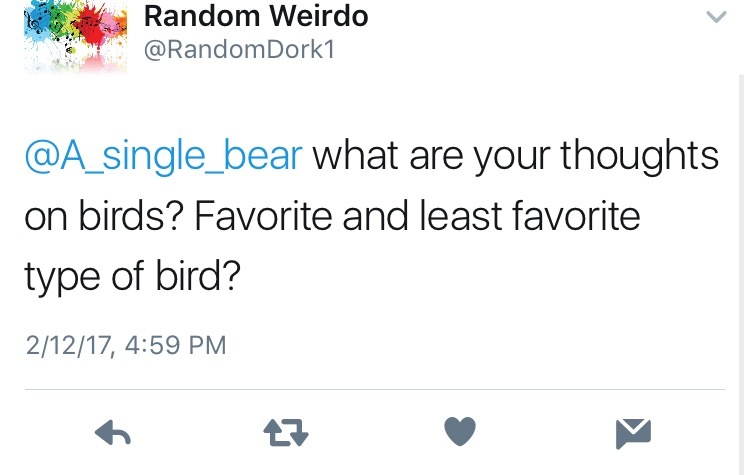 A: I have a very storied relationship with birds. My interactions with them have ranged from pleasant (that time those baby birds took temporary residence in my belly fur) to awful (whenever those mean robins laugh at me when I trip and fall). It is hard to really pinpoint how I feel about birds as a whole. I form my opinion on them on a bird-by-bird basis. I am a bear. 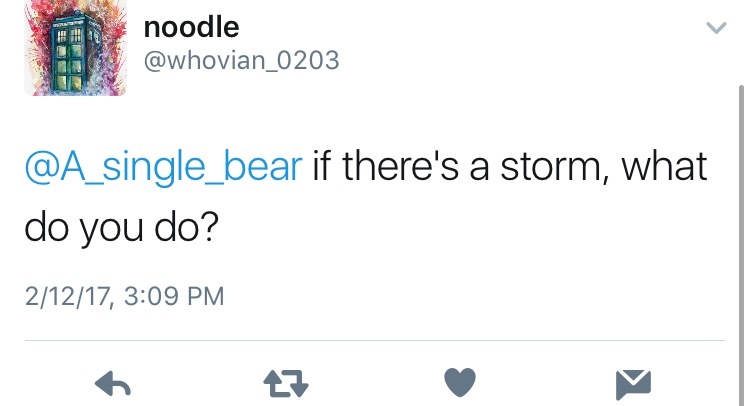 A: I certainly hope so. I have no desire to test this, however. 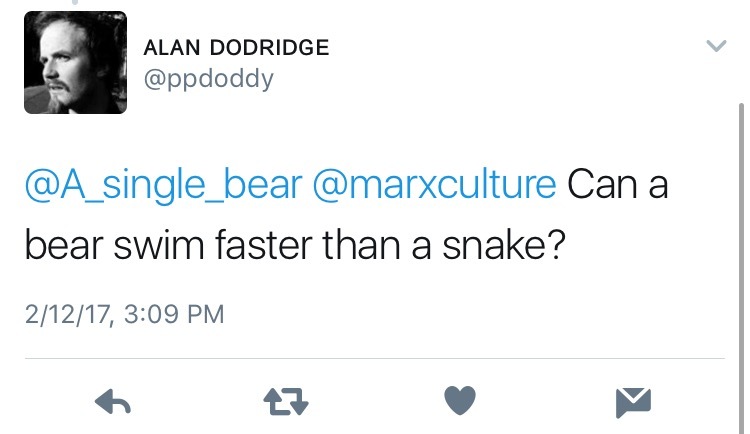 A: There is no “deal” when it comes to snakes. They are horrible creatures and they frighten me to no end. Have you seen them run? They have no legs, but they can run. It takes me four legs to run. I do not know why they exist, and I am certain they hate me. A: I do not know what most of this questions means, but have you tried looking in dumpsters? I usually look for things in dumpsters because there are so many things in dumpsters. You could try big rocks, too. There are lots of things under big rocks. 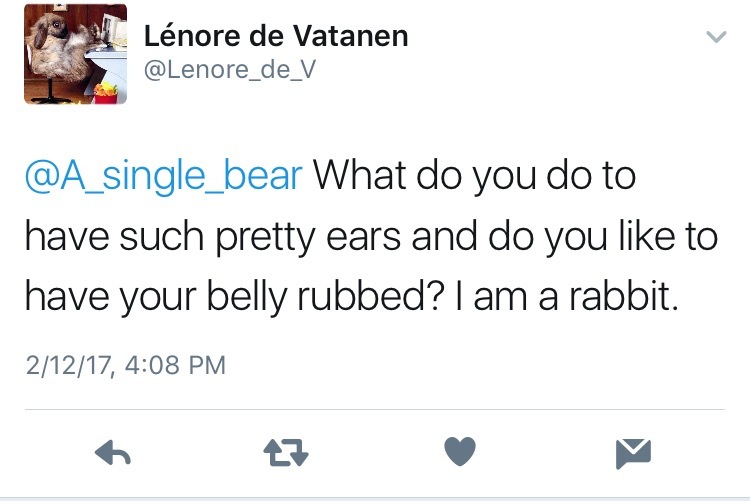 A: I am a bear. 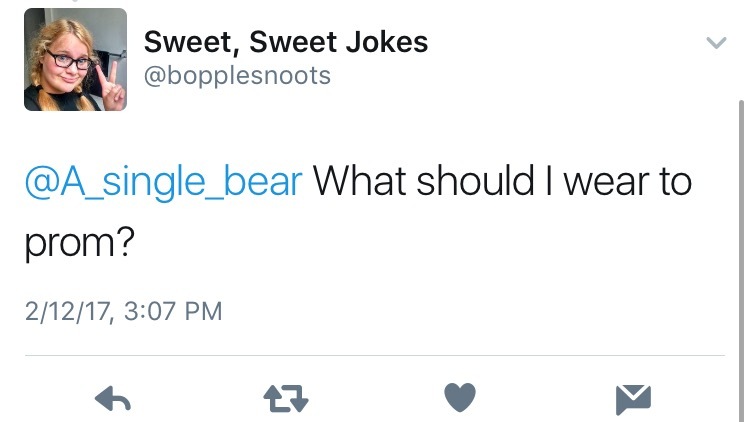 This entry was posted in Questions and answers and tagged answers, bear, bear blog, bears, humans, nature, questions, the forest, tree, twitter, wordpress on February 13, 2017 by A bear.